As we embark on another summer of student internships at Stark Enterprises, it’s hard to not think back to my internship experience with Forest City. I found that time to be an invaluable asset as I learned the inner workings of a NYSE-listed national real estate company. Although so much has changed in our industry within the last 10 years, it’s those lessons I learned about teamwork, perseverance, client relationships and work ethic that I continue to carry with me every day. I seized the opportunity to craft my own business style, to learn how to be an active listener and to shadow the mentors who continue to have an impact on my leadership responsibilities at Stark Enterprises. The best internships throw you head-first into the social dynamics of an organization and afford you experiences and opportunities that cannot be gained in the classroom. In my opinion it’s the absolute best way to transition from college life to corporate life. With that in mind, the internship program at Stark Enterprises continues to grow and evolve. Last year, we were fortunate to partner with the City of Cleveland as part of our downtown nuCLEus project. Through our Community Benefits Program, we selected two recent graduates from John Hay High School to join our office for the summer. Both students are interested in pursuing careers in architecture, so we gave them the assignment to help design the community green roof space that will be a signature component of the project’s overall design and amenity package. It’s a tall order for any architecture firm so we knew it would excite the students to have the opportunity to work on such a high-profile, transformational project. 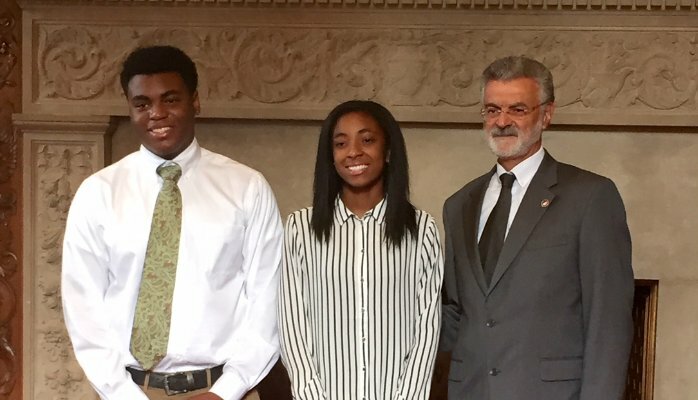 To cap it off, both students presented their plans to our team at Stark as well as to Mayor Frank Jackson – an incredible experience for them as well as the company. To build on their experience, both interns were invited back this summer to work on an upcoming student housing project that’s in our pipeline. We’ve expanded their roles by having them work one-on-one with each department of the company – from development and construction to operations, leasing and marketing – so they gain a comprehensive view of a project from start to finish. Along with the graduates from John Hay, we also hired summer interns at Crocker Park, Eton Chagrin Boulevard, as well as an intern in development at our downtown corporate office. No matter what their fields of study may be, we encourage all the students to dabble in different departments and maximize their opportunities to learn in a vertically-integrated organization like ours. In return, our company reaps the benefits of their new ideas and fresh perspectives. We love learning about some of the latest trends and social technologies from the next generation. We’re exploring an exciting opportunity to take our internship program to a national level. I look forward to sharing those updates with you in a future post. Until then, I’m curious to know – what’s the most important thing you gained from your internship and how has your company best capitalized on this out-of-classroom learning experience?